In the afternoon, YCU held the conference on the preparation for the evaluation by Ministry of Education on undergraduate teaching at Room 1515 of Administration Building. The meeting was hosted by President Xue Yaowen, with others university leaders Yao Jihuan, Zhang Fengqin, Zhang Yumin, Li Shenmin, Huang Jieyu, and cadres above deputy department dean attended the meeting. 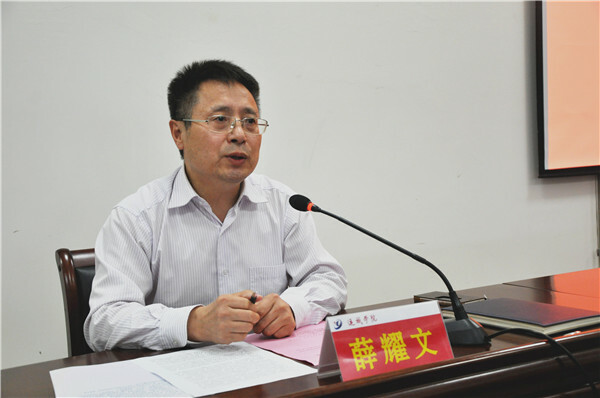 Li Yongkang, dean of Department of Teaching Quality Assessment, reported the issues found in the pre-evaluation, and arranged the following work, including organization and procedure of the evaluation work, classroom teaching, test paper examination, internship base and employment base, interview by the evaluation experts, campus culture, and academic atmosphere, etc. Yao Jihuan, Secretary of the Party Committee of YCU, gave an important speech. He attached great importance to the meeting, and asked related departments to find and then solve the problems in their own work. He hoped that the staff should polish their work based on requirements from four perspectives: 1) requirement and hope of the Party and the Country, 2) requirements from undergraduate teaching evaluation by the Ministry of Education, 3) requirements of the orientation and objectives of YCU, 4) requirements in the preparation for the evaluation. Firstly, based on the spirits from the National Educational Conference, National Conference on Ideological and Political Work in Universities, and Xi Jinping’s Speech at the colloquium in Beijing Normal University, Yao asked that YCU should adhere to “Four Services”. that is, adherence to service for the people, for governance and politics of the Party, for the consolidation and development of Socialism System, and for the reforms and opening up and socialism modernization. And Marxism theories, socialist core values should be carried out in daily teaching，and harmonious campus and excellent studying atmosphere be built. Secondly, the teaching evaluation is an examination of the work with respect to the university orientation, objectives. He stressed that the importance should be attached to inward construction in the preparation for the evaluation. Thirdly, the teaching-focus, locality, application should be made clear in university orientation of YCU, which should be reflected in the development objectives, making Hedong culture, integration of teaching and production, and idiomatic teacher training education its preponderance, thus to realize the high-level goal of internationalization and informatization. Finally, detailed requirements were put forward to help the university be well prepared the forthcoming evaluation. 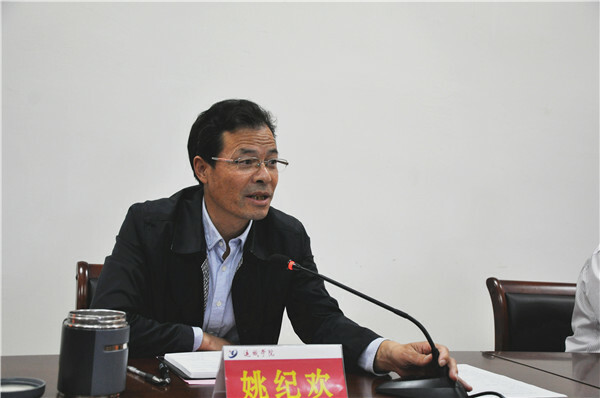 Xue Yaowen, deputy secretary and President of the university, summarized the pre-evaluation and put forward some requirements in the forthcoming evaluation. Firstly, he said, the preponderance found in the pre-evaluation boosted our confidence, and the problems detected provided us with guidance in future work. Secondly, well-performed departments in pre-evaluation were praised. Thirdly, all the staff should follow the mental state of the experts in the pre-evaluation group to further improve working quality and efficiency in the preparation of the evaluation. In addition, Department of Teaching Quality Assessment should issue the detailed problems found in the pre-evaluation to the departments concerned, and university leaders should supervise and coordinate the implementation of the work. Finally, Xue asked all the departments to hold evaluation preparation meeting to prepare all the staff for the forthcoming evaluation.